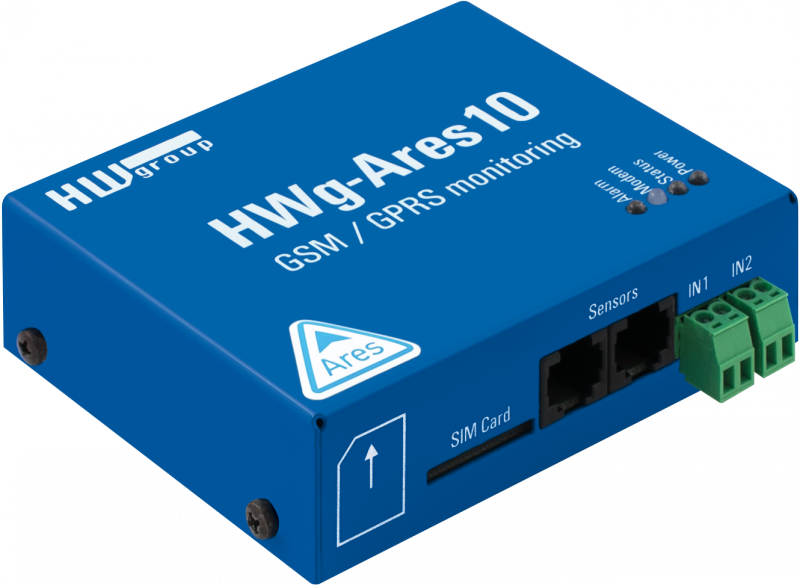 Ares 10 is a cost-effective GSM thermometer for remote monitoring and alerting over GSM for locations without LAN access. Connect up to 3 external sensors and 2 dry contact detectors. Remote configuration via SensDesk.com portal. Ares 12 is an industrial unit for remote monitoring and alarming over GSM for locations without LAN access. Includes battery backup. Connect up to 14 external sensors and 2 dry contact detectors. Remote configuration via SensDesk.com portal. The HWg-PWR3/12/25 is a smart Ethernet gateway which captures data from up to 3 / 12 / 25 external meters on the M-Bus. With external M-Bus (EN 13757) meters it can be used for remote monitoring a metering of water, electricity, gas or heatconsumption. Poseidon2 3268 supports up to 8 sensors connected over 1-Wire UNI / 1-Wire and up to 4 detectors connected to digital inputs. Poseidon2 3268 can control 2 digital NO/NC relay outputs, as well as up to 8 virtual digital outputs (VDO) at remote Poseidon2 or Damocles2 units (M2M). Poseidon2 3468 supports up to 8 sensors connected over 1-Wire UNI / 1-Wire and up to 4 detectors connected to digital inputs. Poseidon2 3468 can control 2 digital 230 V / 16 A relay outputs, as well as up to 8 virtual digital outputs (VDO) at remote Poseidon2 or Damocles2 units (M2M). Poseidon2 4002 can connect up to 42 sensors (16 via 1-Wire UNI/1-Wire + 26 via RS-485), provides 12 digital dry contact inputs (DI), 8 virtual digital outputs and allows control of 4 relay outputs (NO/NC). Damocles2 devices are designed to monitor and control digital I/O over the network using secure M2M protocols (HTTPs, IPv6, SNMPv3). With support for over 50 SNMP and SCADA applications, Damocles2 devices can be integrated in a wide range of monitoring and control systems. MQTT protocol enables integration in IoT solutions. Damocles2 1208 provides 12 digital dry contact inputs (DI). All digital inputs feature S0 pulse counters with a memory to connect water, gas, electricity or other meters. Damocles2 1208 controls 8 digital open collector outputs (DO). Damocles2 MINI provides 4 digital dry contact inputs. All digital inputs feature S0 pulse counters with a memory to connect water, gas, electricity or other meters. Damocles2 MINI controls 2 digital relay outputs (DO). In a user defined period the IP WatchDog2 Lite detects the status of internet connection and LAN connected devices. The IP WatchDog2 Lite can monitor up to ten channels. In a user defined period the IP WatchDog2 Industrial detects the status of internet connection, LAN connected devices and RS-232 connected devices. The IP WatchDog2 Industrial can monitor up to ten channels including up to two RS-232. In case the internet connection or any monitored device stops responding the IP WatchDog2 Industrial can restart up to two connected devices via its 230V/16A NO/NC relay DO. HWg-SMS-GW3 is a gateway that enables HW group products to send text message alarms. Send SMS alarms from all HW group products in your LAN. No software needed, works over a LAN at the Box-2-Box (Peer-to-Peer) level. Save administration costs and effort – use only a single SIM for all devices. SensDesk.com online portal can use this gateway for sending SMS alerts, if it’s placed on the public IP address.